I've read through rooting instructions, and I need to flash a .tar file, but the flashing software Odin is only for PC. Is there another root method I can use? Welcome to the world of Heimdall! Heimdall is an alternative software to Odin, ready to use on Linux, Mac, and Windows systems. Use the link above to find the proper version and then download and install (I recommend you use 1.3.1 for now as 1.3.2 has been reported to be problematic). After install, make sure to reboot your computer as the installation includes a kernel extension and it's just safer to reboot rather than log in/out. 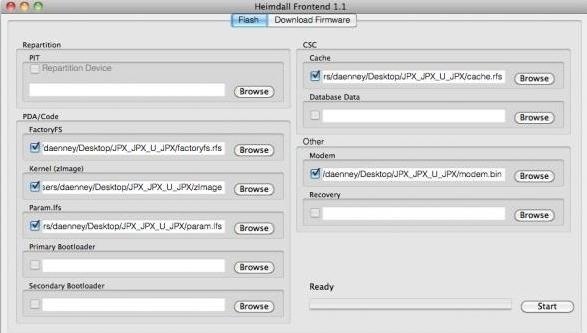 One major difference between Heimdall and Odin is that with Heimdall, you will need to extract the .tar file and select what you want to flash. Simply plug in the files to their respective fields (you may not have Kernel zImage file, it depends on what you're flashing). Now you're ready to flash. Make sure you have a good charge on your phone and fire it up into download mode (with phone off, hold Volume Down, Home, and Power at the same time, then Volume Up to get past the warning screen). Once there, plug in the USB cable and hit Start. When it's done, you're phone will reboot into recovery, and once again with the new firmware. You. Are. Done. The video uses Windows (ignore the beginning when the drivers are being installed) and a Galaxy Tab, but the principles are the same. Warning: Attempting to overwrite core system files may be detrimental to the function of your device. Proceed carefully, this guide is only meant to provide information and does not provide any protection against losing function of your device.